So, it’s been a busy few weeks. Last month my novel The Deep And Shining Dark was released. This month, my novella A Glimmer Of Silver came out from The Book Smugglers. It’s available from Amazon US, Amazon UK, and Smashwords. It has been getting good reviews, too, which is awesome. 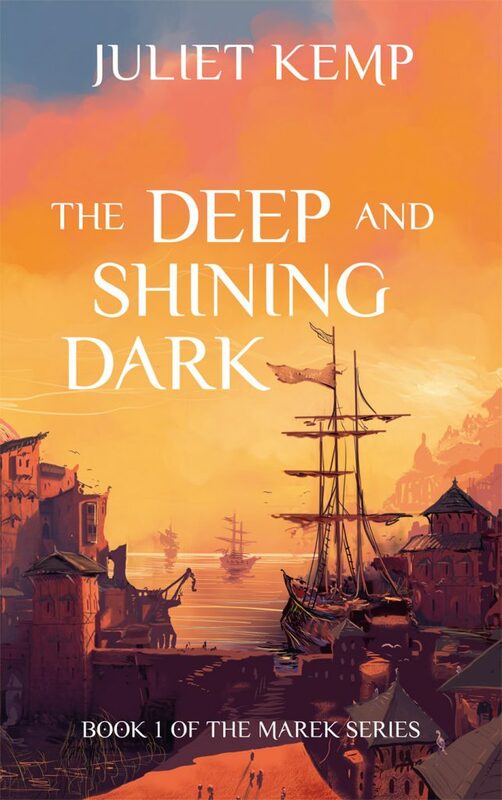 The Deep And Shining Dark: out now! My novel The Deep And Shining Dark (Book One of the Marek Series) was released last Friday! It’s currently available as an ebook from various retailers; the print version will be out in September. You know something’s wrong when the cityangel turns up at your door…. The thing I find hardest about writing is plot (or possibly structure, or possibly both); so this year my main aim is to get better at constructing a story which hangs together well, especially at novel length. Historically I’ve tended to just get on and write, and then fix everything in editing; but that means that editing can wind up looking like a full rewrite, by the time I’ve corrected the structural issues that result (for me) from writing that way, and fixed up all the gaping plot holes. I do really love the thing that happens when I’m getting words down onto the screen at speed and letting my brain carry me away; but I’m also fed up with a first draft that looks quite so unformed. So I’ve been reading a lot about plot and story structure (best book so far: John Yorke’s Into The Woods, though ‘best’ here may just mean ‘fits best with my brain’, and trying to use all of it to write an outline for my next project, which involves London and dragons and too many secrets. After an initial flaily period it’s starting to come together, and I’m looking forward to getting cracking on the writing. But I’m determined to sort out the holes I can still see first, this time, rather than putting them out of mind and ‘just writing’. So it might be another few days yet. I wrote a post for The Book Smugglers about books that got me through 2017. They’ll be publishing my novella, “Voices of the Sea”, later this year! So. New plan for 2018 reading: get through all of those (or officially DNF them) before I buy anything else new (with exceptions for new releases of series I’m already following). Having just tidied up my Goodreads records from last year, that comes out at 175 books (which still misses a few from the library and an awful lot of fic). So 107 books plus magazines should keep me going til the summer. So far I’ve read 10 books in 2018, but several of those were novellas or shorter; also quite a few of the TBR pile have stayed as TBR for a while because I anticipate them being slightly harder going. Recommended so far from 2018 reading: the Belladonna University novellas by Tansy Rayner Roberts (Fake Geek Girl, Unmagical Boy Story, and The Bromancers, all fluffy Australian magic college stories with a big dollop of geek-culture), and Dreadnought by April Daniels (trans superhero YA).